This two hour balloon flight is an unforgettable experience just for you and your party. On request we pick you up at your hotel (Zurich, Lucerne) free of charge and serve you during the whole Tour. After the Tour our Crew will serve Champagne and snacks before bringing you back to the starting point. These flight take place under good weather conditions only. Available in the regions of Zurich, Zug and Lucerne. This flight is available for a private group of 1-3 persons or 4-6 persons. Larger groups are asked to contact us by phone or e-mail. The basic principle is simple: Hot air is lighter than cool air and creates a lift. 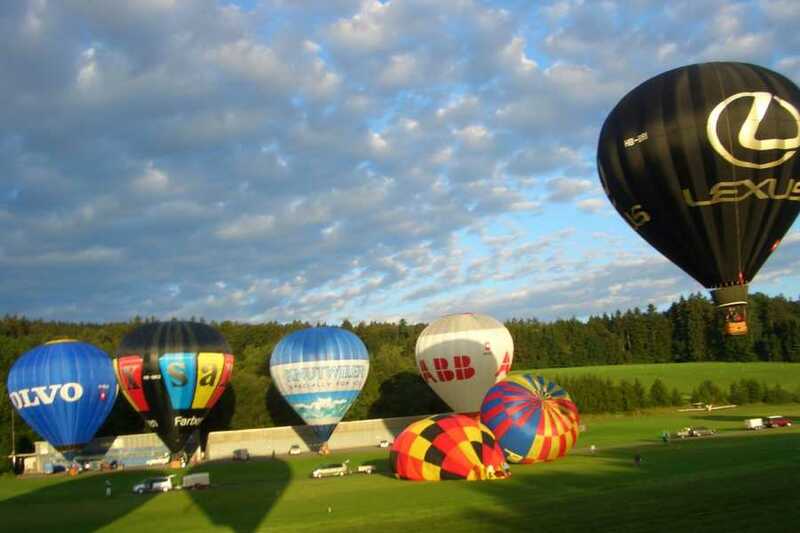 A modern hot air balloon consists of 4 essential parts: envelope, basket, burner and gas cylinders. The envelope is made of lightweight, airtight nylon with special coating. The basket is wattled of willow, just like 200 years ago. The air inside the envelope is heated with a powerful but quite silent gas burner. The gas (propane) is carried inside the basket in steel cylinders. Modern balloons can lift between 1 and 20 passengers. A real balloon flight is much more than just a simple jump in the air or a comfy scenic flight – it’s a small adventure. Passengers and crew gather at the designated take off location. Together they get the balloon ready for take off. This takes about 30 minutes. Unlike an airplane ride, the destination is unknown, because the balloon’s direction and speed depends completely on the wind conditions. Since the balloon travels with the wind, it’s always calm inside the basket. The pilot can influence the course of the balloon by climbing or descending into different currents of air. The pilot is in permanent radio contact with the ground crew, which will meet with the balloon at the landing position. After completed landing the balloon is taken apart and stowed in the truck. Due to the dependency on weather, balloon flights can only take place safely under ideal conditions and require careful planning. The decision whether to take off or not quite often cannot be taken until a short time before the actual flight. In Summer, the flights take place after sunrise or before sunset, in spring and fall the flights are scheduled in afternoon hours. Overall, 5 to 8 hours of time, have to be planned. Dress like you would for an outdoor hike. Long pants and comfortable footwear like boots or tennis shoes are recommended. Avoid sandals and shorts, since we could land in open fields (dirt, thorns, etc). It isn't noticeably cooler in the balloon during the flight than it will be on the ground, so dress for the temperature of the day. Layered clothing during the cooler months is advisable. Can I fly if I just had surgery or if I am pregnant? Ballooning is an active sport requiring medium physical fitness. We do not fly passengers who had recent bone fractures or surgery within six months of flight without their doctor's permission. We do not fly passengers who are pregnant. We do not offer flights for children under 6 years of age. Most younger children are scared by the noise of the burner. So be sure to have a responsible adult watching over the children if they come out to watch the launch. Children under 12 can fly when accompanied by an adult. We take your safety very seriously and ask that you tell us if any passengers in your party are under 12 or over 65 as they will only be flown when the wind forecast is very light to calm. Our professional pilots licensed by the Swiss Federal Authority of Civil Air Transportation operate all flights offered by HB-AdventureSwitzerland. Experienced pilots will operate only new and impeccably maintained and commercially operated aircrafts and equipment. Insurance coverage according to IATA convention standards for international civil air transportation is included. All flights are subject to favourable weather conditions. Therefore, we cannot guarantee for a flight to take place at the designated date and time. Flights canceled due to reasons related to weather or safety will be refunded (less booking fee of CHF 50.00 p.P.). Please contact us to learn more about the detailled itinerary.